Emerging from the internationally recognised Theorising Normalcy and the Mundane conference series, the chapters in this book offer wide-ranging critiques of that most pervasive of ideas, "normal". In particular, they explore the precarious positions we are presented with and, more often than not, forced into by "normal", and its operating system, "normalcy" (Davis,2010). They are written by activists, students, practitioners and academics and offer related but diverse approaches. Importantly, however, the chapters also ask, what if increasingly precarious encounters with, and positions of, marginality and non-normativity offers us a chance (perhaps the chance) to critically explore the possibilities of “imagining otherwise”? The book questions the privileged position of “non-normativity” in youth and unpacks the expectation of the “normal” student in both higher and primary education. It uses the position of transable people to push the boundaries of “disability”, interrogates the psycho-emotional disablism of box-ticking bureaucracy and spotlights the “urge to know” impairment. It draws on cross-movement and cross-disciplinary work around disability to explore topics as diverse as drug use, The Bible and relational autonomy. Finally, and perhaps most controversially, it explores the benefits of (re)instating “normal”. By paying attention to the opportunities presented amongst the fissures of critique and defiance, this book offers new applications and perspectives for thinking through the most ordinary of ideas, “normal”. Rebecca Mallett is a Principal Lecturer at the Sheffield Institute of Education (Sheffield Hallam University, UK). Her main areas of research include “disability” in popular culture, the constitution and regulation of interpretative strategies within cultural disability studies and, more recently, the commodification of impairment. She is on the editorial board of Disability and Society, is a fellow of the Higher Education Academy, and co-coordinates the Disability Research Forum. Cassandra A. Ogden is Senior Lecturer and Programme Leader for Sociology at the University of Chester. Her PhD thesis explored the experiences of children with Inflammatory Bowel Disease, which fuelled her interest in exploring the social disgust of particular bodies and the stigma people face due to perceived differences of the body. Much of Cassandra’s current work utilises a critical disability studies perspective but she has also published and co-published on disability hate crime, childhood illness experiences, the social and legal responses to smoking in public and its impact upon the incarcerated, quality of life research, the narrative inquiry technique and the use of food banks in Cheshire. Jenny Slater is a Senior Lecturer in Education and Disability Studies at Sheffield Hallam University. Her doctoral studies involved spending time with two youth groups in the north of England as well as with young disabled women running Iceland’s first and only user-led independent living centre. Her research explores youth and disability as social, cultural and political constructs. She is particularly interested in thinking about “youth” and “disability” alongside gender, sexuality and the body. In her latest research she is working with disabled, queer and trans people’s organisations to think about “access”, “identity” and toilets. Theorising Normalcy and the Mundane (edited by Rebecca Mallett, Cassandra A. Ogden and Jenny Slater) by David Jackson-Perry, Disability and Society, 32(7), 1111-1113. ... this collection never promised us a rose garden; it is an edgy and at times uneven rollick through ab/normalcy, and as the chapters unfold they play in increasingly uncomfortable corners, interrogating the tools of the norm while quietly jostling and queering the codes of ‘abnormalcy’. Boxall’s chapter, coming where it does, signifies the complexity, the fabulous folly of trying to locate all this varied and ‘brilliant imperfection’(Clare 2017) on common ground. Theorising Normalcy and the Mundane sketches out fragmentary maps of that ground, bringing into relief bridges and points of encounter, but also pitfalls, locations where meetings may be fraught with dissent. The tools of normal are well oiled, colluding efficiently through diagnosis, classification, class averages, bureaucratic process, and other less visible techniques. These chapters argue in turn for collaboration. They call on academics and teachers, disability theories and drug user studies, the transabled, the transgendered, and the dis/abled, all those who fall outside the protective umbrella of ‘normal’, to use these sometimes inconvenient and unsought intersections as gaps through which to insert the less well-honed tools that challenge normalcy. The contradictions and complexities of such a project do not make for a comfortable read. Rather, these postcards from the conference extend an invitation to readers to have their cages well and truly rattled: an invitation I would encourage them to accept. 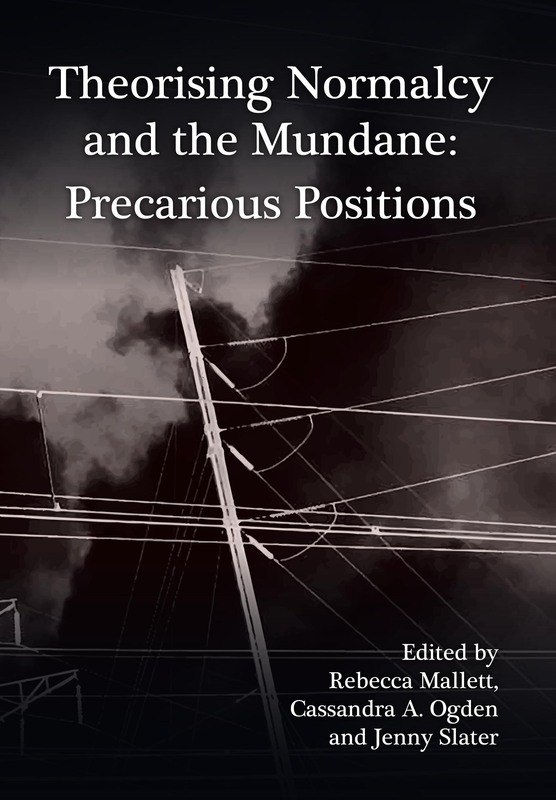 Rebecca Mallett, Cassandra A. Ogden and Jenny Slater, Theorising Normalcy and the Mundane: Precarious Positions, 2016, ISBN 978-1-908258-20-5, £17.99. The e-book (ISBN 978-1-908258-49-6) is currently available through Google Play, ebrary, EBL, EBSCO, Ebook Central, Gardners and Dawsonera.